Halloween is nearly here, which means that we have an excuse to be naughty and eat unhealthy treats. However, it may be quite difficult for some people to find some time to actually make something delicious. 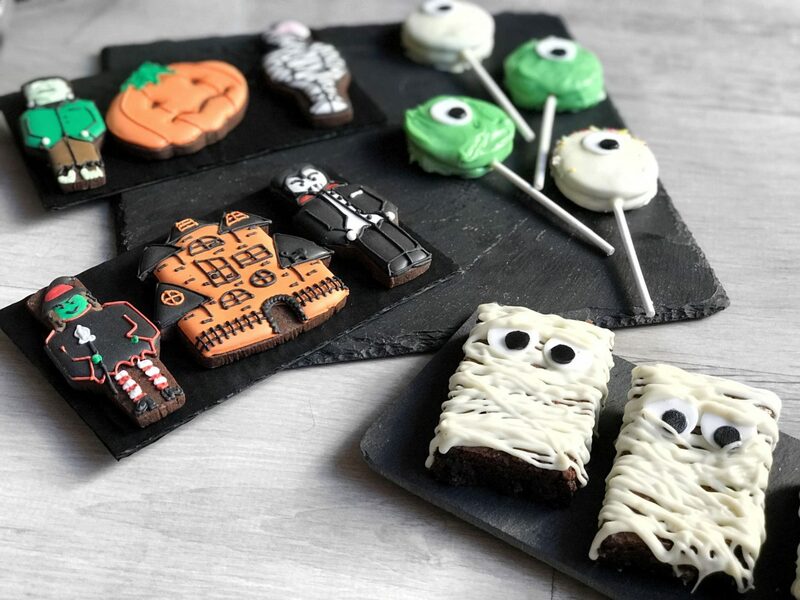 For this reason, I thought I could share with you some ideas so that you can eat a few yummy treats on Halloween. They are very quick and easy to make, so you shouldn’t have any problem. You can even involve the kids in this. The first thing I am going to show you are mummy brownies. Even though it is proper baking, the recipe couldn’t be easier. The first thing you need to do is bake a brownie or if you are feeling lazy you can buy one. To be honest, any recipe that you like will be fine, but I love this one (here) from Cupcake Jemma. I just skipped the cookie dough part this time. Once you have finished the baking part and your brownie has cooled down, you will need to melt some white chocolate. As always, you can do this on a bowl over simmering water or just use the microwave – it’s up to you. When melted, put it in a piping bag and pipe it over the pieces of brownie that you should previously cut. Do it in a zigzag pattern so that it looks like the cloth of a real mummy. Then you will need some candy eyes for it and you’ll have finished. I couldn’t find any candy eyes where I live, so I had to make mine with some black and white fondant. This treat is even easier to make than the other one. You’ll need a pack of Oreos, some lollipop sticks, candy eyes (or you can make your own eyes with fondant as I did), white chocolate and food colouring. You can actually use any kind of chocolate – it depends on the kind of monster you want to create. In order to make them, you will have to open the Oreos so that you can insert the sticks in them. Then you will need to dip them in melted white chocolate, drain the excess and place them onto a cooling rack. Keep in mind that if you are planning to use food colouring, you will have to be very careful because the consistency of the white chocolate can change. It will probably become thicker, so you’ll need to use some extra oil. The last step is to decorate them with the eyes, sprinkles and whatever you want. I used a bit of fondant to make a little horn for one of the monsters. Be creative! The last treat I am going to talk about is the best option for the laziest, which basically is that you can buy some treats! I have previously shown you some biscuit tins from Biscuiteers and my opinion hasn’t changed. Their biscuits are delicious, extremely cute and handmade, which is why I couldn’t recommend them more. 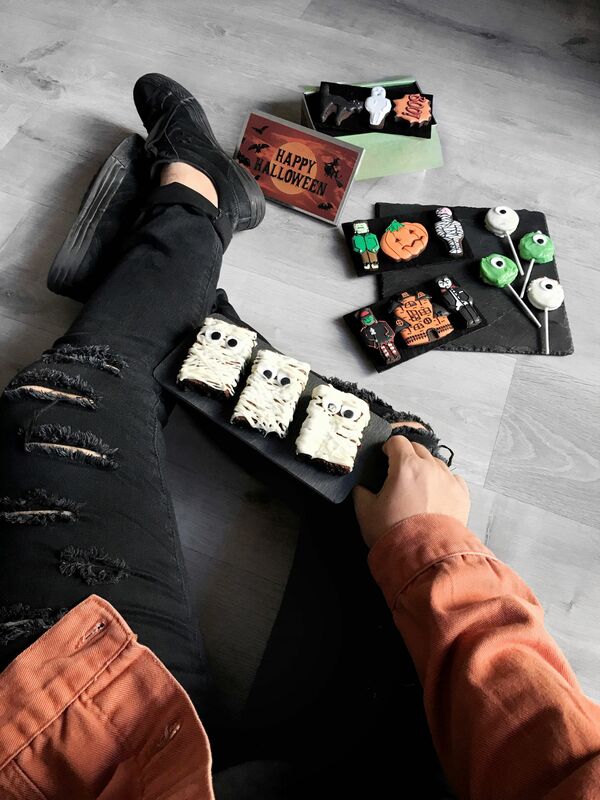 They have a Halloween collection available now (you can check it out here) that includes their Haunted House Biscuit Tin, which is the one that you can see in the photos. I think it is a great option because of the quality and because you can even give them to someone as a present and I am sure they’ll love them. I honestly hope you found this post useful and kind of sorted you out for Halloween. I must warn you that the brownies will probably be the ones that will disappear first. In fact, I have none of these treats left now thanks to my friends and family, so it would be nice if you could also share with me some recipes in the comments. Also, let me know what you’ll be doing for Halloween, as I still don’t know what to do or what to wear so I need as many ideas as possible.